Add the flour to a clean mixing bowl. Mix the salt through the flour. Add the water and sourdough starter. Combine all the ingredients together to form a rough dough. Turn the dough out onto a clean work surface. Knead the dough for 10 seconds. Return to the mixing bowl and set aside for approximately 10 minutes. As the dough rests, the gluten within continues to develop. It also creates time when you can continue with your daily life. When kneading, do not worry if the dough is slightly wet or sticky. Resist the temptation to add any extra flour. After 10 minutes, return to the dough. Turn the dough out onto the work surface and knead for 10 seconds, then return the dough to the mixing bowl and allow the dough to rest for a further 10 minutes. The dough will need to be kneaded one more time. After the third time of kneading for 10 seconds, the dough should be smooth and elastic. Return the dough to the mixing bowl, cover with cling film and allow the dough to prove for four hours at room temperature. After four hours, turn the dough onto a clean work surface and knock the dough back. Knocking back the dough simply involves knocking the air from the dough and equalising the temperature within. Form the dough into a tight round ball. Prepare a proving basket by lightly dusting with flour; if you do not have a proving basket, line a 2.5l round Pyrex dish with a clean tea towel and dust with flour. Place the dough into the proving basket or the Pyrex dish, seam-side facing up. Prepare the lid of the Pyrex dish by greasing and dusting with flour; this will prevent the dough from sticking to the lid later. Cover the Pyrex dish with the lid and place in the fridge overnight. The next morning, preheat your oven to 230˚C/210˚C fan/gas mark 8. Remove the Pyrex dish containing your dough from the fridge. Flip the dish over, so the bowl of the dish now becomes the lid. Remove the tea towel. Using a sharp knife, slash the surface of the dough; this is what is known as the baker’s signature. The dough can be cut up to ½ cm deep. Cover the dough with the bowl of the Pyrex dish and place into the oven. Baking the dough in the Pyrex dish means there is no need to steam the oven. Baked with a lid on, the bread creates its own steam, which will allow the dough to rise and open up while baking. The Pyrex is very similar to the old style of Dutch oven baking. The dough will need to be baked for 50 minutes. After 25 minutes, remove the lid from the Pyrex dish, then continue to bake for a further 25 minutes. Once baked, remove the bread from the Pyrex dish and allow to cool. Alternatively, if you have a proving basket, simply remove the proving basket from the fridge. Preheat the oven to 230˚C/210˚C fan/gas mark 8 and place a baking tray in the bottom of the oven. 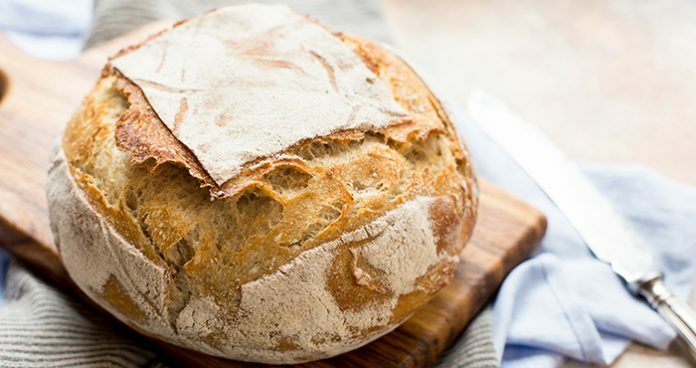 Turn the sourdough dough loaf out onto a baking tray or hot baking stone. Flour, score or glaze as required and put into the preheated oven. To create steam, add a handful of ice cubes or pour in some water from a boiling kettle onto the preheated baking tray in the base of the oven. This will release a blast of steam into the oven. Bake for 30-35 minutes or until a good crust has formed and the bread sounds hollow when tapped on the base. TOP TIP: a Pyrex dish is that acts like a proving basket. The dish acts as a support to your dough. It encourages the dough the take on the shape of the dish and to prove upwards, and not just to spread out flat. The dough will also be baked in the Pyrex dish. Using a fridge reduces the temperature of the dough, allowing it to prove slower and longer, which allows for a greater development of flavour within the dough but also increases its digestibility. As dough ferments or proves, the gluten within the dough breaks down. The longer a dough is allowed to prove, the more flavour it will contain and the easier it is for your body to digest. This recipe is a courtesy of Patrick Ryan, guest editor on our latest issue. 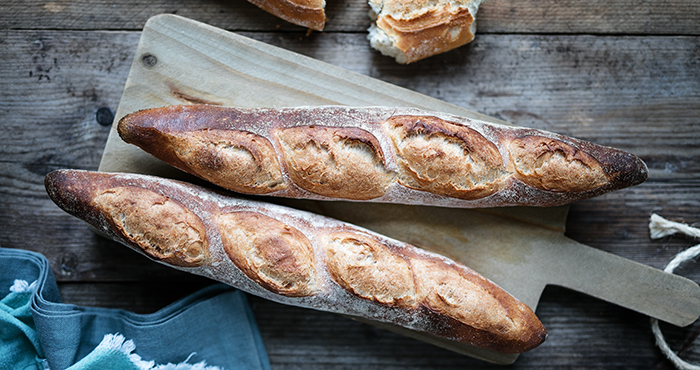 Check out our interview with the founder of The Firehouse Bread School, and find out more about his white semi-sourdough crusty baguette recipe or learn how to make a multi-purpose enriched white yeasted dough.